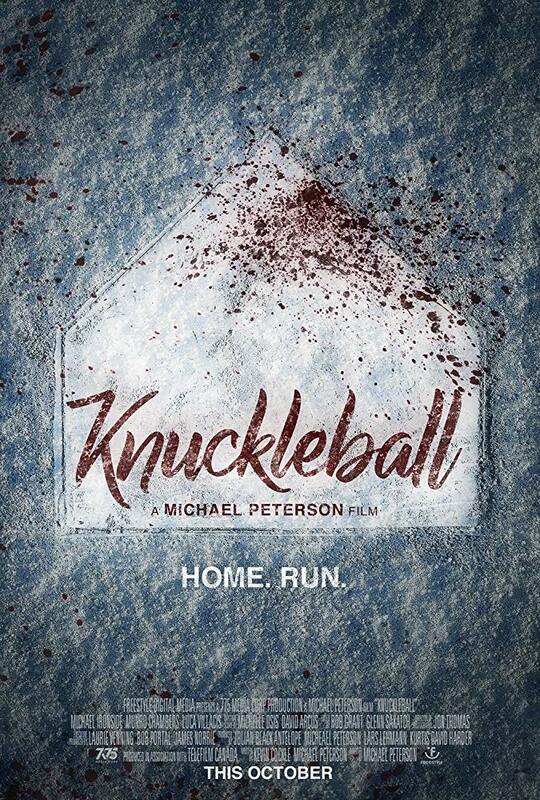 The poster for co-writer-director Michael Peterson’s horror thriller, ‘Knuckleball,’ which stars Michael Ironside. A wave of terror has been unleashed, as a dark family legacy is also being revealed. The increasing sense of dread and sinister secrets are making themselves known in the new horror movie, ‘Knuckleball,’ which stars Michael Ironside, and was directed by Michael Peterson. The drama was released in theaters and On Demand and Digital HD this past weekend by Freestyle Digital Media, after it was an Official Selection at this summer’s Fantasia Film Festival. In honor of the thriller’s being distributed in theaters and on home entertainment this month, Shockya is offering one lucky winner a copy of the movie’s poster, which is signed by Ironside and Peterson. To enter, email us at ShockyaGiveaway@aol.com. Let us know that you’re entering to win the ‘Knuckleball’ poster giveaway in the email’s subject line and message. You have until next next Wednesday, October 17, to enter, and you can enter the contest once daily. After October 17, we’ll pick the winner at random, and notify them through email. Good luck! In addition to Ironside, ‘Knuckleball’ also stars Luca Villacis (‘Channel Zero’), Kathleen Munroe (‘Patriot, ‘Resurrection’) and Chenier Hundal (‘Arrow’). In addition to helming the drama, Peterson also co-wrote the script with Kevin Cockle. ‘Knuckleball’ follows 12-year-old Henry (Villacis), as he finds himself alone and targeted on an isolated farm. He’s at the center of a maelstrom of terror, and a dark family legacy, when his secretive grandfather dies suddenly in the night.